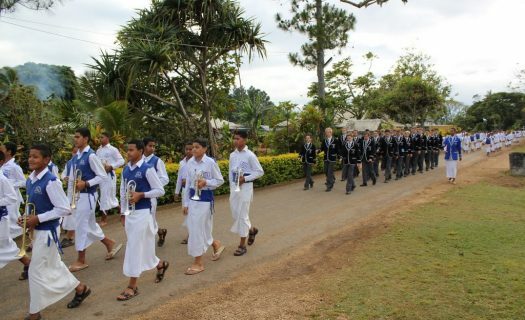 Newington College's close relationship with Tonga stretches back to the late 1800s. Newington College’s relationship with Tonga goes back to 1863. Newington’s first Headmaster, Rev James Egan Moulton, was appointed to Newington as an interim measure to give him time to marry before taking up a Wesleyan missionary role in Tonga. In 1866, he became the founding Headmaster of what is now Newington’s brother school, Tupou College. The close relationship between the two institutions continues today. ONU Tongan Bursaries are awarded to young men who are residents of Tonga and either attend Tupou College, or are sons or grandsons of Old Boys of Newington. They must be eligible to enter Year 10 as boarders and turn 16 during Year 10 or Year 11. Bursaries are awarded to applicants who possess a reasonable fluency in English, sound academic ability, character and leadership attributes, and strength in sporting and/or cultural activities (music, drama, art). What does an ONU Tongan Bursary cover? One economy return airfare to Tonga each year (in Years 10, 11 and 12). For more information about Newington College’s Tongan Bursaries, please contact our Admissions Office.